Breaking news: Britain’s Greatest Generation is about to appear in paperback (May 19th) – but hang on, what was that I was saying about titles…? 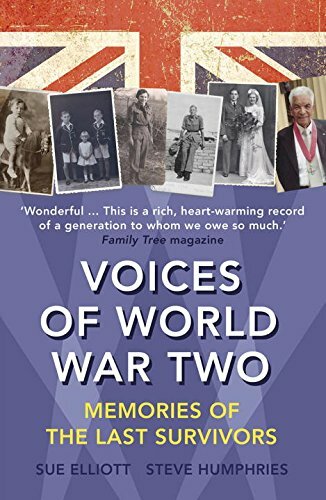 Random House, in their wisdom, have decided on a title change, so the paperback will appear as Voices of World War Two: Memories of the Last Survivors. You can s ee the logic. War titles sell. And perhaps BGG wasn’t sufficiently Ronseal to speak to potential buyers. The fact that it’s a lot more than ‘the war’ (though it is the centrepiece of the book and our subjects’ lives) is neither here nor there when it comes to marketing. And the reworking is cheekily aligned with the successful ‘Voices of...’ 20th century history franchise (thank the gods of publishing there’s no copyright on titles). So it’s probably a canny move. Bookseller reports strong advance orders, so we shall see whether a change of title can engineer a change of fortune on the sales front. Meanwhile, I Heard My Country Calling is unlikely to see the light of day in paperback. Hardback sales haven’t been sufficient to justify it apparently, which is mightily disappointing but unsurprising given the lack of marketing effort.